(This is for Slice of Life, a weekly writing adventure with Two Writing Teachers, and for the National Day on Writing 2015). Over at our iAnthology writing space, an unofficial online site for National Writing Project-affiliated teachers to hang out and write each week, I put out the call for teachers for today’s National Day on Writing celebration. The Day on Writing is hosted by the National Council of Teachers of English (NCTE) and supported by a wide range of other organizations, including NWP. 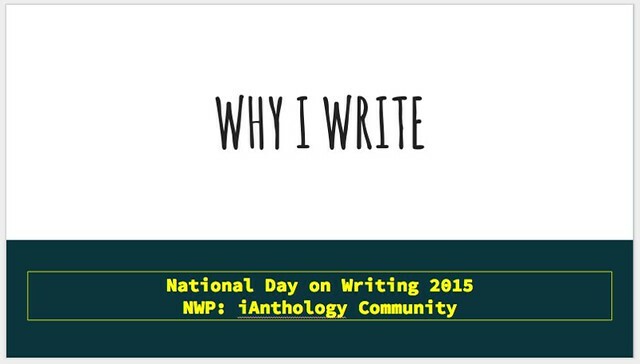 Each year, there is a theme, and this year’s theme is “Why I Write,” a theme that was explored during the first years of NDOW (National Day on Writing) and provided some interesting depth to responses of writers in all age groups. I’m doing a podcasting activity with my sixth graders today. They wrote a prompt yesterday about “why I write” and I will be showing them Garageband today, and we will be using my Blue Snowball microphone for sharing out thoughts with voice, and then connecting with the world via the #whyiwrite hashtag on Twitter. I love getting voice out in the mix. For this collaboration with NWP teachers, I went a simple route with a low technology threshold. I set up a Google Slideshow and sent out the link, asking folks to choose a slide and write. (I will be doing a similar activity this coming weekend at an event for Western Massachusetts Writing Project). The whole idea is to invite us in as writers, and explore writing from a meta-thinking angle. The range of reasoning, and how writing so deeply impacts our daily lives, is at the heart of this kind of prompt. From the joy of writing to the need to understand the world to coming to terms with loss to tapping into childhood memories, the responses hit on many topics, all with a three word prompt. This entry was posted in nwp, Slice of Life. Bookmark the permalink. This is great Kevin. I love how you bring this to your students and us. I added into Michelle’s post. Now to explore your links! Great, Kevin. I’ve saved the slide show to get to later. Hope I find the time to share. Wow, you took this special day and are using it so many different ways that it takes my breath away. Good luck with all your activities. I love how you are answering the question in many different ways with different groups. I am glad you write!